strangely dim - "an indescribable specimen of anthropologic potency"
"an indescribable specimen of anthropologic potency"
Leta S. Hollingworth’s Children Above 180 IQ Stanford-Binet is worth reading in its entirety. Her early-20th century recommendations for educating gifted children are spot-on, rooted in decades of experience and observation, and, depressingly, just as ignored today as they were nearly a hundred years ago. Her work brims with tellingly sharp insights. I first heard about her book from Grady Towers’s classic essay “The Outsiders,” which quoted an abridged version of the passage below. If you don’t read Hollingworth’s book, at least read this passage; every word is gold. What happens after the wedding is the real love story. “But they had forgotten something; they had forgotten journalism. They had forgotten that there exists in the modern world, perhaps for the first time in history, a class of people whose interest is not that things should happen well or happen badly, should happen successfully or happen unsuccessfully, should happen to the advantage of this party or the advantage of that party, but whose interest simply is that things should happen. I'm not sure how I'm expected to test this Zum-branded "bidet in a bottle" in the middle of the grocery store aisle in which it was found, but I think I'll just give it the benefit of the doubt. “European music is founded on the artificial sound of a note and a scale; in this it is the opposite of the objective sound of the world. Since its beginnings, Western music is bound, by an insurmountable convention, to the need to express subjectivity. It stands against the harsh sound of the outside world just as the sensitive soul stands against the insensibility of the universe. The first paragraph is a keen and valid observation. The second… I'm usually a fan of Kundera's philosophical writings (which are most of his writings in one way or another), but I'm disappointed by this. Maybe it's lost something in the translation from the French, but at least in English it's wishy-washy (just about anything "could come") and worse, trivial. Yes, "sentiment"—and emotion, and empathetic feelings, and tribalism, and even nostalgia—can drive both love and hate. There will be no abrupt revelation; the duality of sentiment has always been obvious. I think Kundera's constant crusade against kitsch has gone a little too far here. And frankly, I'm surprised that an atheist existentialist novelist, of all people, might suggest dismissing anything that "relieves the coldness of his reason." 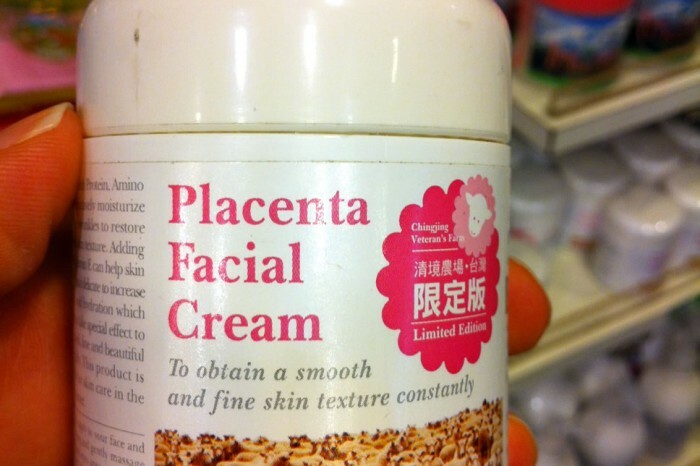 I'm inclined to value whatever relief I can get. 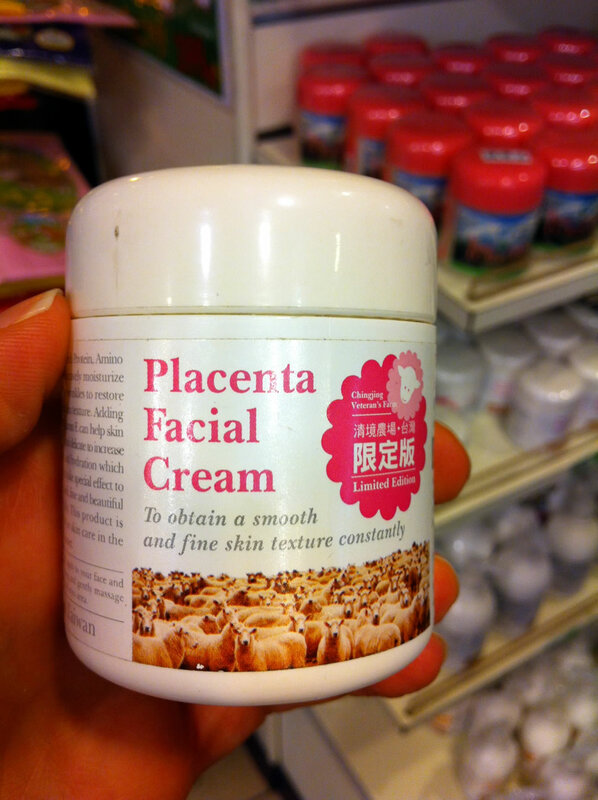 I'm sure this stuff might work great, and the Chingjing Veteran's Farm where it's sold is worth a trip if you're in the area in Taiwan, but I'm not sure the extremely straightforward packaging would work so well in the U.S. And yet, on the long list of bizarre stuff people willingly smear all over their faces in the name of beauty, sheep placenta isn't even the strangest. Pandora Radio is where I find most of my new music these days. When I hear a song I really like for the first time, I bookmark it, and usually end up going over my bookmarks sometime later and buying a lot of the tracks on Amazon. Unfortunately, the big music companies, for reasons unfathomable to sane and rational people, are still trying their hardest to prevent anyone from buying their music, and have mandated a 6-track "skip limit" for Pandora. Looking for new music, and already own (or dislike) the next few songs Pandora plays? Tough – after 6 skips (12 if you switch stations), you're stuck with whatever happens to be playing. Delete any normal browser cookies from the pandora.com domain. For the curious, Safari stores its cookies in .plist format, which can be primitively read and manipulated by a command-line utility that comes with OS X called PlistBuddy. Due credit to this code snippet for hints on how to use it to delete cookies. Safari's cookies are stored in ~/Library/Cookies/Cookies.plist . Flash stores its cookies in ~/Library/Preferences/Macromedia Flash Player/#SharedObjects/ . A colleague of mine recently asked if I knew of any applications that would allow him to save and backup voicemail off his iPhone. He had found The Missing Sync, but frankly $40 is a bit steep just to save voicemail; he didn't need to do anything else. A quick search turned up an article describing how to save voicemail from a jailbroken iPhone, but nothing so simple for a non-jailbroken phone. The article did, however, drop a clue: voicemails are stored in AMR format. iPhone backup files are conveniently all stored in a directory named for the phone's ID in "~/Library/Application Support/MobileSync/Backup/". The files all have a .mddata or .mdinfo extension. Could any of them contain an AMR file? According to the AMR format RFC, plain, single-channel AMR files should start with the ASCII string "#!AMR\n". A simple grep revealed that several files in fact contained the AMR header. As it turns out, Apple has politely stored each voicemail in its own, separate file – no file carving is necessary to extract the voicemail. That'll copy all the voicemail for the current user's iPhone(s) to the current directory, named with a .amr extension. (Both QuickTime and iTunes can play .amr files.) Note that this can take a minute or two – so be patient for at least a couple minutes if it looks like nothing is happening. 1. pushd changes the current directory and stores the previous current directory in the $OLDPWD environment variable. The "Application Support" directory has an unfortunate space in it, which makes it a bit tougher to throw around pathnames using it without getting the escaping just right – I didn't want to bother with it. 2. The find command looks for only those files that end in .mddata to save a small amount of time (there are no voicemails in .mdinfo files) and then passes each to grep. grep is used to look for files with the AMR header; the -la options are used to quit looking through a file after the first match (again, this is for a small speed improvement – the AMR header ends with a newline and must be the first thing in an AMR file, which means grep is able to move on quicker on the few files that match) and to treat files as text. 3. Use basename to strip off the .mddata filename extension so we can make a copy of the .mddata file with a .amr extension. 5. popd restores the current directory to the original working directory. There are tons of different ways of doing the same thing; I tried for a little while to find one that was functionally equivalent (using xargs rather than a for-loop and bash substring manipulation rather than basename, etc.) but would fit in a Twitter update, but alas, I'm not a bash expert, and failed. If you can come up with a shorter one-liner, feel free to leave it in the comments. It needs to be general (it can't assume a specific iPhone ID, for example), and needs to assume a very large number of files in the backup directory (such that "grep '#\!AMR' *" would likely fail due to "*" being too long; that happens to be the case for me). Other than that, have fun. 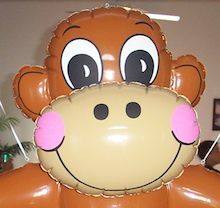 I'm a big, inflatable monkey.